WordPress loop is actually a code, used to display the main content and excerpts of content on your WordPress blog. 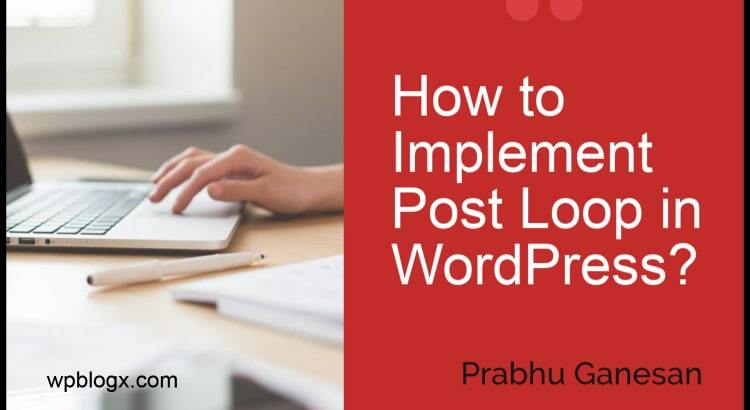 In simple, this WordPress loop is used to display posts. It is used in WordPress theme, to display the posts on your WordPress website. It displays all the information, that the WordPress has about the posts. You can insert the post loop code wherever you want, mostly it is been placed in the index.php file. Since the index page by default will be your blog homepage. Initially, the loop starts checking that, the current webpage should display multiple lists of posts or a single post. If the page has to be displayed with the list of posts, then it will list the title and excerpt for each post. Or if the page to be displayed with a single post, it will just display the content of the page. If a visitor access for the page that doesn’t exist or if no page is available, then the loop will give an error message stating that there is no page or post available. The lines of code <?php if(have_posts()) : while(have_posts()) : the_post(); ?>, <?php endwhile; else: ?>, <?php endif; ?> states that when there is blog post and when there is no blog post. The lines <h2><?php the _title(); ?> </h2>, <?php the_post_thumbnail(); ?>, <?php the_excerpt(); ?> will actually display the title, featured image, and excerpt of the post. while(have_posts()): the_post() → This part of code actually reads and the process of repeating as many times as there are posts. Note: You can use pagination to limit the number of posts that are looped through a page. Both the post loops are important for displaying blog post. It gives you a clear specification and makes your task easy. Hope you got an idea about post loop. If you have any queries or suggestions, please feel free to comment us. You can subscribe to us at Facebook and Twitter. Part 5: How to Include Custom Body Class Function in your WordPress Theme?